Non-enveloped, bacilliform, about 50 nm in length and 30 nm in width, resembling those of cileviruses. 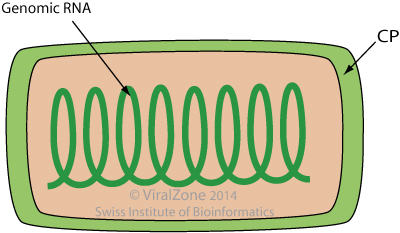 Segmented, tripartite, linear, ssRNA(+) genome. The three segments are about 8.4, 3.2 and 3.1 kb in size. The genomic RNA is capped, and polyadenylated. Genomic RNAs serve as messenger RNAs. RNA1 contains 1 ORF encoding the replicase. RNA2 contains 4 ORFs, and may encode a movement proteins. RNA3 contains 3 ORFs.